There has always been a love for the Martin diamond volute in the custom lutherie community. We all lust over the beauty and elegance of this vintage detail. I never really fell for it myself. I read post-after-post on instrument maker forums. Builders gnashing over the mineutia of each facet of the interlocking joint. In my head, I'd always envisioned the joint was formed as a monolithic tenon in a mortice ... that was until I read American Lutherie #102. After seeing the complexity of the Martin birds-beak joint I was compelled to realize the simpler design I had in my head. 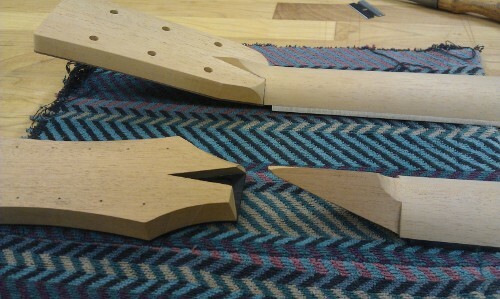 My joint is formed by a large traiangular tenon that joins a V-shaped mortice in the headstock. This is always what I'd imagined. On the back of the neck, it forms the same type of diamond volute that is seen on 19th century Martin necks. An importatn part of the strength of this joint is that the ends of the headstock seat onto small "cheeks" of neck end-grain. 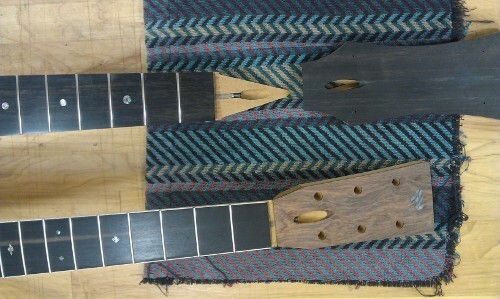 That and the forward pull of the strings puts the glue line of the joint in compression. 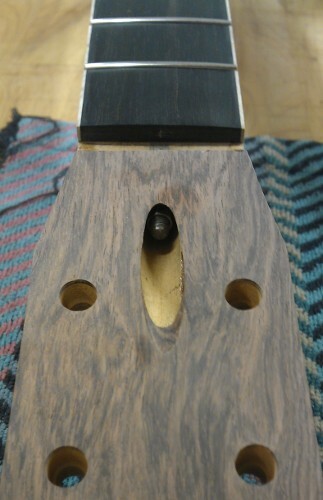 Even without glue, the joint would seat tight from string tension, and hold. 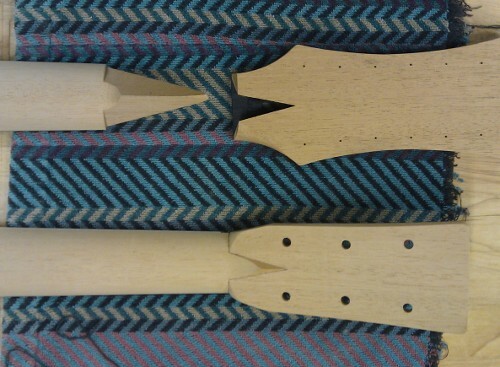 I plan on making a guitar with the headstock seated dry, no glue, to show the beauty of this geometry. My preferred truss-rod is a simple compression rod, mainly because it is light. Fortunately, this headstock joint is amenable to the compression rod's adjusting nut at the headstock. The large traingular tenon provides a big block of wood for the nut to bear against - And it is a continuous extension of the neckshaft. With an access hole cut into the headstock veneer, the nut is easy to get to, and everything appears to have been cut at the same time. I've developed tools to cut the tenon, mortice and truss-rod access. These tools make forming this joint repeatable and relaible with a minimum of adjustment to get a perfect fit.